We had such a good time yesterday. It was actually the first time I had done this with the children--EVER! We have been doing a lot with spring plants lately. Every year we plant a flower to go home on Mother's Day for Mom. This year I decided to jazz the whole thing up. We became scientists yesterday and experimented with planting seeds. Each class had three science experiments: We planted flower seeds in dirt (our Mother's Day flowers); we planted bean seeds in cotton; and we planted grass seed on sponges for the AM class and bird seed on sponges in the PM class. We then made a chart--our hypothesis--as to which plants will grow. All of the children felt the seeds will grow in the dirt(let's hope so). They were mixed on the beans growing in the cotton. The whole AM class thought that the seeds would not grow, the PM class was mixed on this. As for the grass seed and bird seed on the sponges, it again was a mixed vote. For our sponge planting I had bought 3 different kinds of sponges; a sea sponge, a cleaning type sponge with lots of holes, and a car wash type sponge which was more foamy. Each child selected one of the sponges, soaked them in the water and then sprinkled them with the appropriate seed. I actually got the sponge idea from one of my Care Courses: Discovery and Exploration With Preschoolers. Along with this course came a science guide; Squishy, Squashy Sponges, full of fun experiments to do with preschoolers and sponges. For the bean planting I did this as a partner activity, another type of suggestion from my Care Courses: Conflict Resolution. In this course they discuss doing activities that involve the children working in pairs or groups to promote cooperation and "working with others." To do this activity each pair of children were given a see through plastic cup, a pile of cotton, and two bean seeds. The children had to get the cotton wet, and put the beans in. Pretty easy, but always fun to play with water. Finally planting the flowers: the children filled a cup with dirt, added some seeds, then gave it some water. We also had fun just playing in the dirt. Our next step is to sit back and wait to see what will grow and how quickly. It was exciting to visit the Pre-K today and they were very interested in our experiment as well. They wanted to know what we planted and what kind of "dirt" we used. I'll keep you posted. 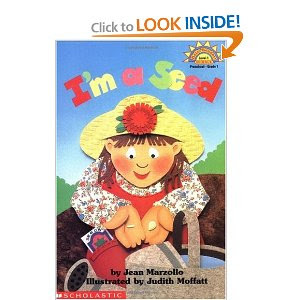 We also read a very fun book called, "I'm a Seed," by Jean Marzollo. It was fun for the children to guess through the book the type of seed that was growing. We also used our counting skills to count all the flowers and our observation skills to try to remember the animals that were on some of the pages. How awesome! I love the predictions and voting. This is terrific activity for exploring science. We plant bean seeds in a plastic baggie with cotton. The children put a few cotton balls in a ziplock baggie, spray the cotton with some water, and then add about 3 or 4 bean seeds. Then we write their name (or they do if they're able) with a permanent marker on the baggie and tape them to the window frames in our academic room. We check them often! After they sprout, we plant them in paper cups and they go home with the kids. Fun! I love this idea. I am going to copy you next month when we do plants and flowers. Thanks!